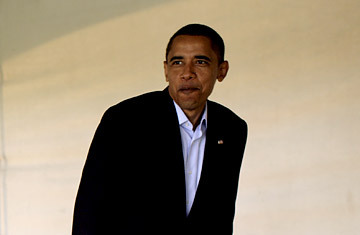 Senator and Presidential nominee Barack Obama. With instant online access to politicians' voting records, policy positions and statements, voters have access to more information than ever about their presidential candidates. So, it would appear that record numbers of Americans will use the Web to root out the information they need before drawing the election-booth curtain this November. At least that's what I thought before I started analyzing the top Internet search terms about each candidate. There are indeed Web searches for Barack Obama's and John McCain's respective platforms, but those searches are in the minority. Rather, U.S. Internet searchers are seemingly more interested in irrelevant facts and bizarre rumors about the candidates and their families. At the top of the search list for each presidential hopeful are physical stats: Obama's height and McCain's age. Also present near the top are queries for "Barack Obama Muslim," which began in earnest after Insight magazine published a story online in January 2007 claiming falsely that Obama had attended a fundamentalist Muslim madrassa as a boy in Indonesia. Meanwhile, the McCain team has seen an increase in searches about the candidate's daughter Meghan and her lunch with The Hills star Heidi Montag. One of the most widely searched terms containing "Obama" over the last four weeks  it was the seventh most popular term, accounting for 0.45% of all U.S. Internet searches that contained "Obama"  was "Obama Antichrist." At first I thought it was a response to the McCain campaign ad called "The One," which ridicules Obama for having a messiah complex and which many people thought drew a comparison between Obama and the Antichrist. But an analysis of Internet search data reveals that queries relating to Obama and the Antichrist started as early as January 2008, preceding the McCain video by over seven months. It's not clear what spurred this particular search to start, but looking closely at the searchers' related Web behavior may give clues to why they're continuing to query "Obama Antichrist" at all. One simple way to understand searcher intent is to analyze, in aggregate, which of the search results people tend to click on. After searching for "Obama Antichrist," people, predictably, tend to go to a blog dedicated to the topic and political blogs commenting on the McCain ad and its connection to the theory. But the most visited search-result site was Snopes.com (16.7% of all visits), the go-to site for debunking urban legends. Snopes.com has had a long and invaluable history as the arbiter of truth regarding those pesky and potentially harmful e-mail chain letters that falsely warn of the health hazards of underarm deodorant or of the risks of having your kidneys stolen right out of your body by organ harvesters at foreign hotels. Over 30% of the traffic to Snopes.com originates from Web-based e-mail domains, since e-mail is the main way these urban myths get spread. The 2008 presidential race is remarkable for the amount of crucial information that is available  and is being purposefully funneled  over the Internet to voters, from YouTube videos to campaign ads to blogs that track every word and movement of the candidates. "Obama Antichrist" is an extreme example of Internet misinformation, but maybe it's a sign that we should approach this onslaught of information with some skepticism. Just in case you're still wondering whether Barack Obama is indeed the Antichrist, I'll save you a trip to Snopes.com. The site has declared this particular urban legend false.